I should be working on my novel. Instead, I am laughing until tears flow (perhaps I needed that) as I read through my journal from 1984. Holy cow, that was a hundred years ago. Or, well, a whole bunch. I was 21. TWENTY-ONE! I have a daughter that’s 21. And one that’s older. Where’s my walker? Anyway, in my typical stream of consciousness insanity, my trip down memory lane started rather innocently with a conversation at lunch. I was sharing a beautiful experience from Mass last night. My colleague and friend is in her church choir and loves music (I surround myself with music-lovers — don’t think I haven’t noticed) and I was telling her about a little girl that sat in front of me and sang with the purest, sweetest, most angelic voice I had ever heard. It truly was like a choir of angels. At first, I thought it was one of the adult women near me, but no, it was the little pig-tailed sweetness in front of me. Listening to that little girl was one of those experiences that I know will remain with me always. There was just something transcendent about it all — her innocence, the clarity, and above all, the absolute joy and love that she radiated. I should worship like that. And it reminded me of another transcendent experience…many years ago. It involved music, too. I was studying in France and was invited to an outdoor music festival. There was a small amphitheater for a more formal show and I was given a ticket to a special performance of Mozart…I can’t remember what it was but it was easily recognizable to me at the time, so I imagine it was selections from Eine Kleine Nachtmusik, no doubt; it when I truly fell in love with the strings…and then a gorgeous piano piece that I don’t remember. That’s what sent me searching for my journal. I was sure I had written about it. 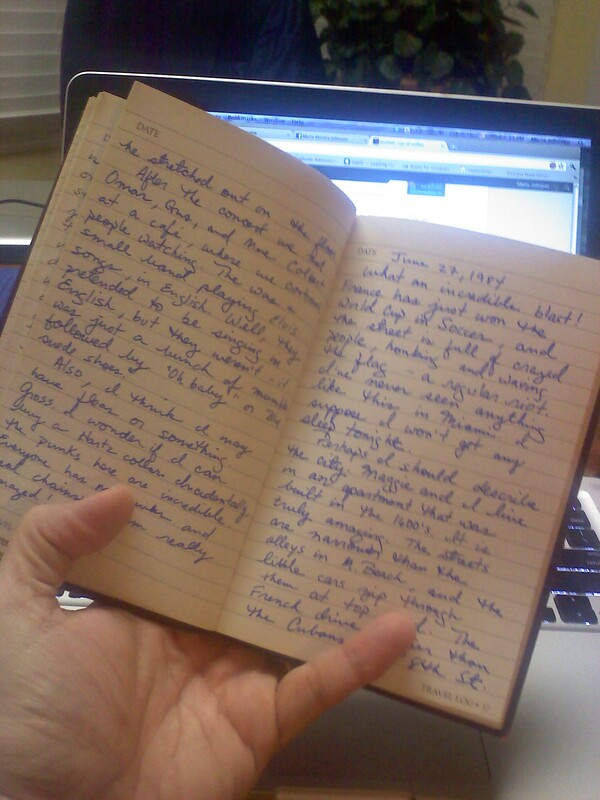 Unfortunately, in a fit of writer’s angst angst, I threw away all my writing in the pre-digital age. 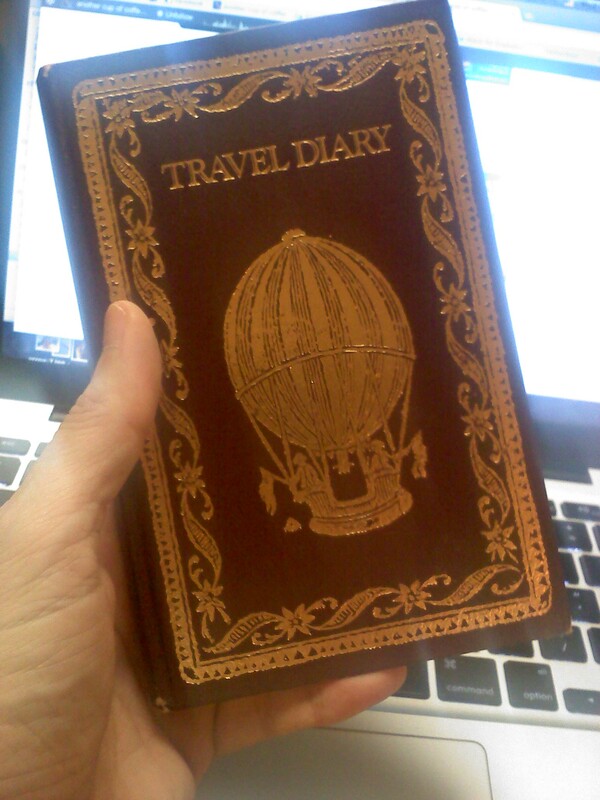 The only thing that remains is this little leather travel journal. I don’t know how it survived, but I am so grateful that it did. It was a gift from a professor and friend who encouraged me and mentored me at a time when I was struggling with my career options. It reminded me, as I laughed through the memories, of how a soft encouraging word or even the acknowledgment of a dream can buoy someone’s spirit. The writing in the journal is sometimes painful to read…I hope I’ve come a long way from that…but I think I’ll keep it on my desk as a reminder to keep plugging along this November. A quarter of a century later, that little journal, and the woman who encouraged me, are still with me. I’ll honor that by trying to do the same. Keep writing, Nanos. The month is still young! ← why am I doing NaNoWriMo…again? Love your post Bego! Glad you didn’t throw away your journal and hope that it will inspire you during NaNoWriMo and beyond! My dear María… isn’t it actually 27 years ago? Sorry to burst your 21-year bubble… 🙂 As usual, love your posts! !